New Winter 2018: This Arabian queen of the arena has won her class and is ready to be displayed with pride wherever she brings the most delight. 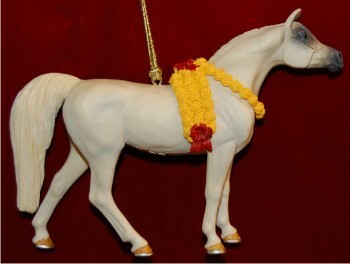 The Arabian mare horse ornament pairs nicely with similar horse ornaments including a palomino, pinto and Morgan. They’re among many personalized horse ornaments from Russell Rhodes, so putting together a collection for your tree or finding gifts for equine enthusiasts is fun and easy. The resin Arabian horse personalized Christmas ornament includes a display cord for convenience and ships in our custom velvet gift pouch.